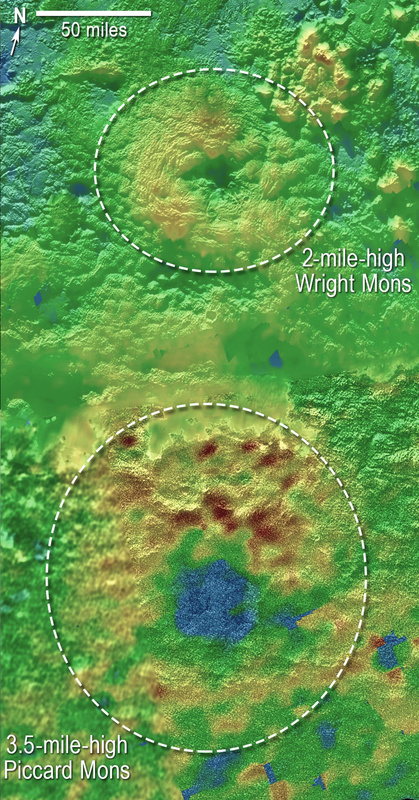 The informally named feature Wright Mons, located south of Sputnik Planum on Pluto, is an unusual feature that’s about 100 miles (160 kilometres) wide and 13,000 feet (4 kilometres) high. 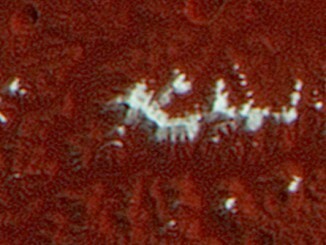 It displays a summit depression (visible in the centre of the image) that’s approximately 35 miles (56 kilometres) across, with a distinctive hummocky texture on its sides. The rim of the summit depression also shows concentric fracturing. New Horizons scientists believe that this mountain and another, Piccard Mons, could have been formed by the ‘cryovolcanic’ eruption of ices from beneath Pluto’s surface. Image credit: NASA/Johns Hopkins University Applied Physics Laboratory/Southwest Research Institute. From possible ice volcanoes to twirling moons, NASA’s New Horizons science team is discussing more than 50 exciting discoveries about Pluto at this week’s 47th Annual Meeting of the American Astronomical Society‘s Division for Planetary Sciences in National Harbor, Maryland. 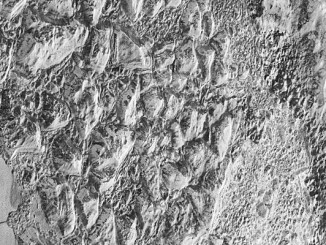 Scientists using New Horizons images of Pluto’s surface to make 3-D topographic maps have discovered that two of Pluto’s mountains, informally named Wright Mons and Piccard Mons, could possibly be ice volcanoes. The colour is shown to depict changes in elevation, with blue indicating lower terrain and brown showing higher elevation; green terrains are at intermediate heights. Image credit: NASA/Johns Hopkins University Applied Physics Laboratory/Southwest Research Institute. For one such discovery, New Horizons geologists combined images of Pluto’s surface to make 3-D maps that indicate two of Pluto’s most distinctive mountains could be cryovolcanoes — ice volcanoes that may have been active in the recent geological past. The two cryovolcano candidates are large features measuring tens of miles or kilometres across and several miles or kilometres high. While their appearance is similar to volcanoes on Earth that spew molten rock, ice volcanoes on Pluto are expected to emit a somewhat melted slurry of substances such as water ice, nitrogen, ammonia, or methane. If Pluto proves to have volcanoes, it will provide an important new clue to its geologic and atmospheric evolution. 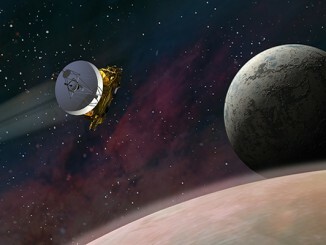 “After all, nothing like this has been seen in the deep outer solar system,” said Jeffrey Moore, New Horizons Geology, Geophysics and Imaging team leader, at Ames. Pluto’s surface varies in age — from ancient, to intermediate, to relatively young — according to another new finding from New Horizons. To determine the age of a surface area of the planet, scientists count crater impacts. The more crater impacts, the older the region likely is. Crater counts of surface areas on Pluto indicate that it has surface regions dating to just after the formation of the planets of our solar system, about four billion years ago. Locations of more than 1,000 craters mapped on Pluto by NASA’s New Horizons mission indicate a wide range of surface ages, which likely means that Pluto has been geologically active throughout its history. Image credit: NASA/Johns Hopkins University Applied Physics Laboratory/Southwest Research Institute. But there also is a vast area that was, in geological terms, born yesterday — meaning it may have formed within the past 10 million years. This area, informally named Sputnik Planum, appears on the left side of Pluto’s “heart” and is completely crater-free in all images received, so far. 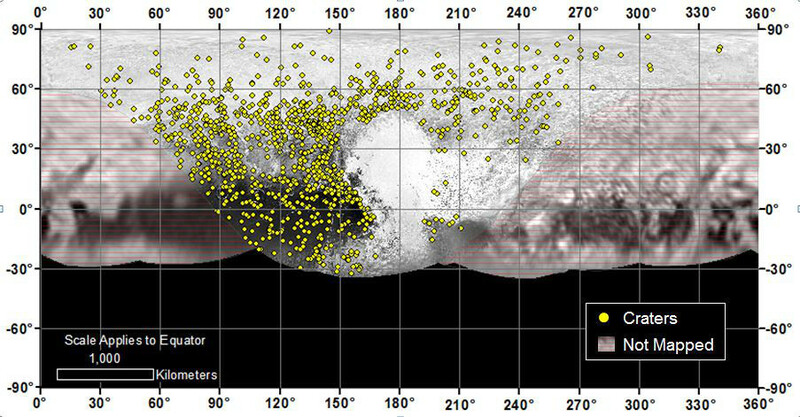 New data from crater counts reveal the presence of intermediate, or “middle-aged,” terrains on Pluto, as well. This suggests Sputnik Planum is not an anomaly — that Pluto has been geologically active throughout much of its more than 4-billion-year history. Crater counts are giving the New Horizons team insight into the structure of the Kuiper Belt itself. The dearth of smaller craters across Pluto and its large moon Charon indicate the Kuiper Belt, which is an unexplored outer region of our solar system, likely had fewer smaller objects than some models had predicted. This leads New Horizons scientists to doubt a longstanding model that all Kuiper Belt objects formed by accumulating much smaller objects — less than a mile wide. The absence of small craters on Pluto and Charon support other models theorising that Kuiper Belt objects tens of miles across may have formed directly, at their current — or close to current — size. In fact, the evidence that many Kuiper Belt objects could have been “born large” has scientists excited that New Horizons’ next potential target — the 30-mile-wide (40-50 kilometre-wide) KBO named 2014 MU69 — which may offer the first detailed look at just such a pristine, ancient building block of the solar system. The New Horizons mission also is shedding new light on Pluto’s fascinating system of moons, and their unusual properties. For example, nearly every other moon in the solar system — including Earth’s moon — is in synchronous rotation, keeping one face toward the planet. This is not the case for Pluto’s small moons. Pluto’s small lunar satellites are spinning much faster, with Hydra — its most distant moon — rotating an unprecedented 89 times during a single lap around the planet. Scientists believe these spin rates may be variable because Charon exerts a strong torque that prevents each small moon from settling down into synchronous rotation. Another oddity of Pluto’s moons: scientists expected the satellites would wobble, but not to such a degree. “Pluto’s moons behave like spinning tops,” said co-investigator Mark Showalter of the SETI Institute in Mountain View, California. 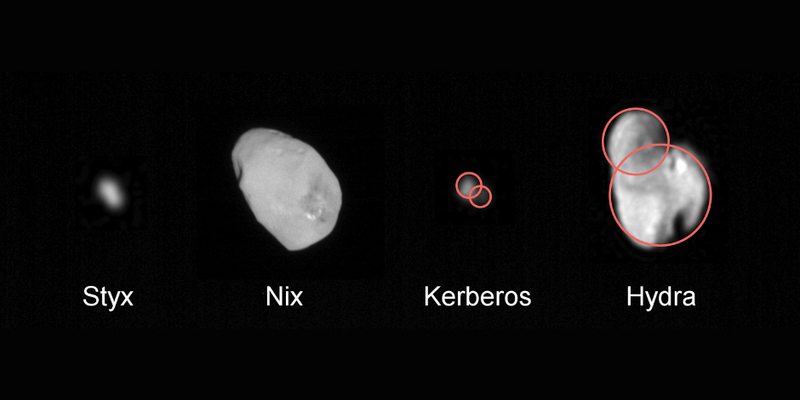 New Horizons data indicates that at least two (and possibly all four) of Pluto’s small moons may be the result of mergers between still smaller moons. If this discovery is borne out with further analysis, it could provide important new clues to the formation of the Pluto system. Image credit: NASA/Johns Hopkins University Applied Physics Laboratory/Southwest Research Institute. Images of Pluto’s four smallest satellites also indicate several of them could be the results of mergers of two or more moons. “We suspect from this that Pluto had more moons in the past, in the aftermath of the big impact that also created Charon,” said Showalter. It is almost five months since New Horizons’ epic encounter with Pluto, but the captured images and data will stream back to Earth across 3 billion miles of interplanetary space for a further 11 months. The first in a series of the best close-ups of the dwarf planet that humans may see for decades have been released, obtained when the spacecraft was just 15 minutes before closest approach during the 14 July flyby. 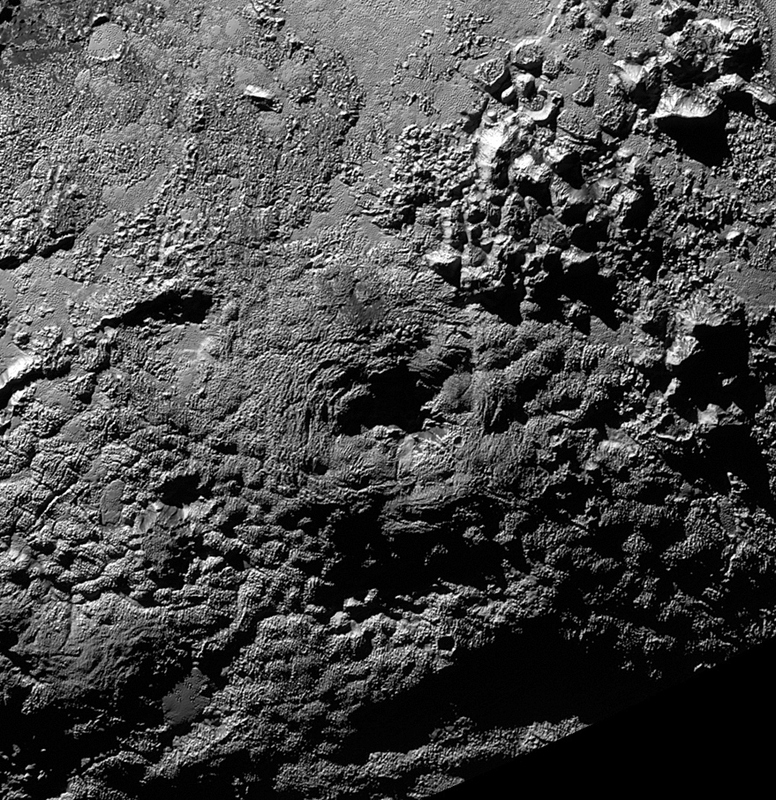 NASA’s New Horizons team has discovered a chain of exotic snowcapped mountains stretching across the dark expanse on Pluto informally named Cthulhu Regio. One of the dwarf planet’s most identifiable features, Cthulhu (pronounced kuh-THU-lu) is a bit larger than the state of Alaska and stretches nearly halfway around Pluto’s equator.